One of our preferred whitening brands at Desert Sun Smiles. If you’re looking in the mirror and feel dissatisfied with the color of your teeth, you may also find that there are too many confusing options for turning them into genuine pearly whites. The market is flush with attractive and easy products such as Crest 3D White Whitestrips, whitening toothpastes, brightening mouthwash, and more. You may even consider that trip to the dental office for a professional whitening or a more advanced version of the “Whitestrips” phenomenon. But what method to whitening teeth is truly the most effective when considering time, cost, and end result? Did you know fruits and vegetables can stain your teeth? Not many people do, but according to Webmd, even apples and potatoes can be contributing to a lackluster smile. Coffee, coffee, coffee. Are you a caffeine addict? A Starbucks connoisseur? Consistent espresso consumption may be gradually discoloring your teeth. Lighting up that cigarette is a sure fire way to turn your teeth into a dentist’s worst nightmare. Plus, it can cause massive oral health issues, cancer, and a smile worthy of a 16th century monarch or a caveman. The dermatologist! Using antibiotics such as tetracycline or doxycycline for clearing up acne? Teeth looking more and more like you smoke two packs of cigarettes a day and single handedly keep your local coffee shop in business? This medication may be the culprit. Be honest with yourself. If you’re not brushing twice a day and flossing regularly than your solution may be as simple as upping your daily dental game. 2. Are The Famed Crest Whitestrips Effective? The short answer is: Yes and no. Yes, they will whiten your teeth, but the trays will only make a difference in the incisor (front) teeth. What this means is that if your smile happens to be larger than life (or at least wide enough that it exposes more than these common front teeth), then you may be left with an only partially brighter smile. If you’re interested in the quickest way to achieve Fabio or Jennifer Aniston level whiteness, a trip to the dental office for in office professional whitening might be very appealing. There are pros and cons to this approach. Pro: The dentist can use a professional whitening formula and decide using a shade matching method where your teeth are currently and what color you would ideally like to reach. For busy professionals this method can generate the same results in one hour as one month of at home approaches. Con: This option costs more than over the counter methods, requires a dental visit of 90 minutes, and can cause sensitivity for those with overly sensitive teeth. If you continue habits such as excessive coffee consumption, smoking, and/or don’t brush or floss effectively, you may need to repeat whitening every 6-12 months. Don’t let yellow or discolored teeth prevent your from making a good first impression or feeling confident on a blind date. The best approach that combines the comfort of Whitestrips with the effectiveness of the dental office is to set up an appointment with your dentist to make personalized whitening trays. The dentist will make these trays by creating molds of your teeth and will provide whitening gel and instructions for their use. Then, achieving a white smile is simply a matter of wearing the trays while doing chores around the house or watching Netflix. 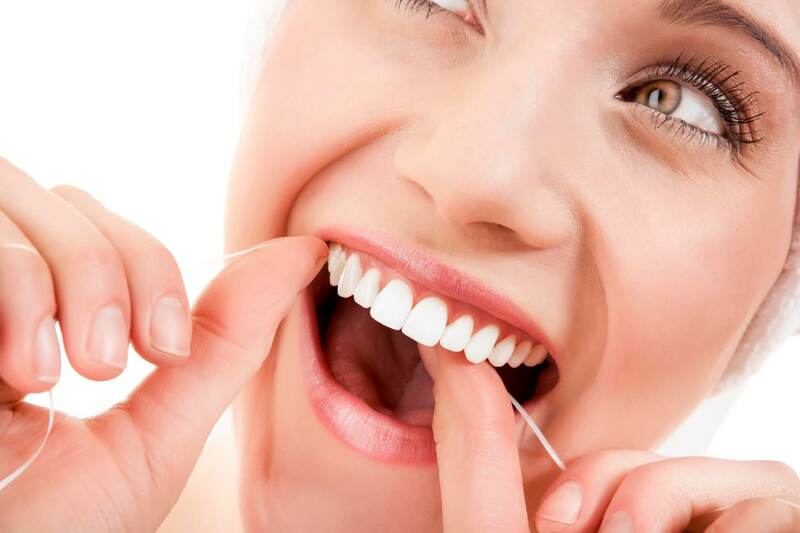 For most people, sticking with a flossing regimen is an all or nothing scenario. Either you floss daily and consistently or you floss one day a year and never again. That day just happens to be the day after post-hygienist guilt sets in. So how can you learn to stick with a flossing regimen? Below are some tips and tricks for committing to that healthy smile. Gum disease can happen to you and eventually it will lead to increased dental health care costs and discomfort. An aesthetically pleasing smile is not one that is missing a tooth. Take advantage of your smartphone and set a calendar alert for once a week to floss. Going whole hog with a new habit is a guaranteed way to give up when you’ve hardly even tried. Instead, set a small and achievable goal for the first few weeks and then incrementally build up to a daily flossing habit. Just because it takes up very little time in your daily schedule and by most estimates would be considered an “easy” activity, doesn’t mean committing to flossing isn’t a significant and difficult paradigm shift. Recognize this and take action, whether it be big or small. Most importantly, remind yourself that a beautiful smile is part of the total health package. One small change in your daily health regimen can make all the difference. Remember how good it will feel to impress your family dental hygienist at the next appointment! Dental injuries related to sports are extremely common. Most commonly the result is a fractured or broken upper front tooth and a split lip. Sometimes the injury results in nothing more than a tooth colored (composite) repair, other times the tooth or teeth damaged will require root canals and crowns or veneers. In the most serious of injuries the teeth can not be saved and have to be replaced with dental bridges or implants. Whether simple or complex the end result is a lifetime of dentistry to deal with an accident that could have been prevented. Sports mouthguards are a simple and inexpensive way to prevent damage to the teeth while engaged in athletic activities. 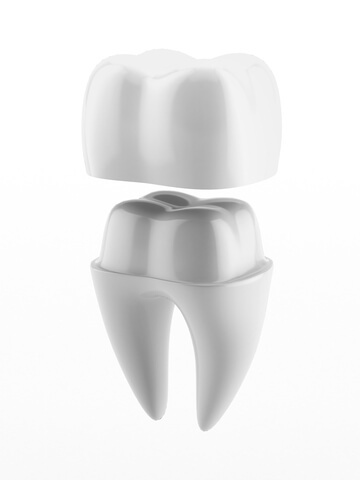 The guards are normally made of a plastic material that is placed over the upper teeth. Most athletes purchase these guards in a sporting goods store. The guard is then placed in hot water at home with the idea that it will conform to the shape of the teeth. As both a mom of three, all of whom played high school sports, and a dentist it is a challenge to sit on the sidelines and watch as the majority of the players have their guard hanging from the corner of their mouths, not in at all or hanging from their helmet all because they are bulky, uncomfortable and do not stay in place over the teeth. 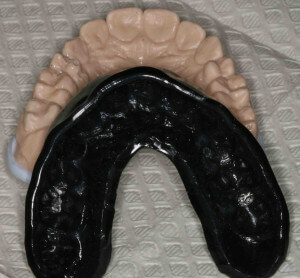 A custom athletic mouthguard is made to fit precisely over your teeth. Once placed over the teeth is stays without the need to bite against it with the lower teeth. This allows the player to speak normally with their teammates without removing the guard, causes less joint and muscle fatigue and makes keeping it in place where it can do it’s job of protecting the teeth much more dependable. The custom guards are also much smaller, less bulky and much more comfortable to wear. An impression of your teeth will be taken and the custom athletic mouthguard will be fabricated on a model of your teeth. the material is a soft plastic, available in many colors so you can show your school pride. If your sport has specific requirements for the color and thickness of the guard it can be made to follow those guidelines and can have a place to connect it to the face mask of a helmet. The most important requirement of an athletic mouthguard is that the player wear it and protect themselves from a lifetime of dental issues. One of the most common questions I hear from patients is how often they need to have dental x-rays. The first thing to understand is that there are many different types of dental x-rays, they show different areas of the teeth and jaws and therefore are used to diagnose different problems. The answer to how often x-rays need to be taken will be different depending on the purpose of the x-ray. The frequency also varies depending upon your personal dental risk factors. Patients who have a higher risk of gum disease will have the x-rays taken to diagnose the bone levels around the teeth more frequently. In the same way patients who get cavities more often should have the x-rays that show the areas between teeth called Bitewings taken more often. Usually the concern is about radiation exposure. All modern digital dental x-rays expose you to very low levels of radiation. we receive more radiation sitting and watching television for a few hours. The risks of not having the x-rays taken can be significant like a cavity that grows and causes the loss of a tooth or the need for a root canal, or an infection around the root of a tooth that goes untreated. We are always happy to talk about the x-rays we are recommending, why we think they are in your best interest and the pros and cons of taking them versus waiting. Panoramic X-ray: Taken usually with the patient standing and the x-ray machine rotates around your head. This image is used for locating wisdom teeth, making sure children have all of their adult teeth and looking at the structure of the upper and lower jaws. Typically a panorex will be recommended at about age 6-8, again at age 16-20 and as a screening to ensure health of the jaws. Bite Wing X-rays: These images are taken by placing a plastic holder inside your mouth and having you bite down to hold it in place. They show equal parts of the upper and lower teeth, and are used to check for cavities between the teeth and the level of bone between the teeth. They can be taken in sets of 4-7 images depending on whether the front teeth are included. These x-rays are normally taken every 12-24 months. 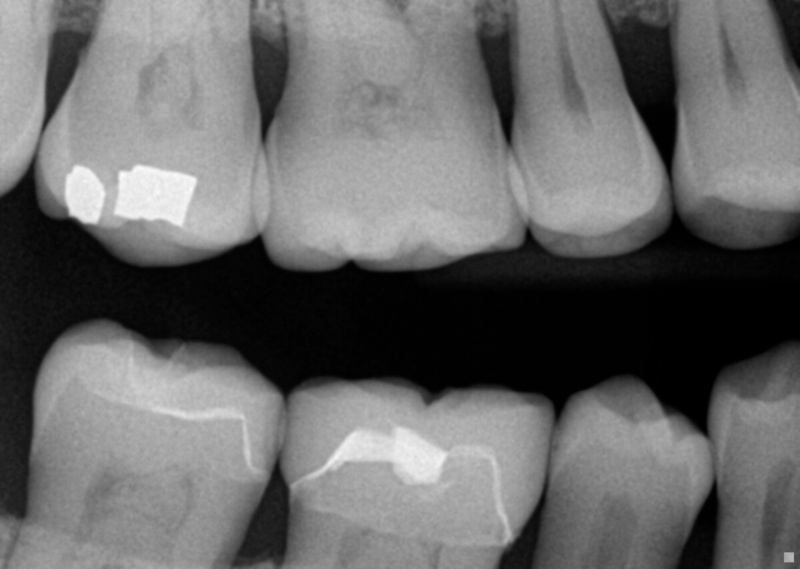 Peri-Apical X-ray: This x-ray is taken to look at the roots of the teeth that are inside the jaw bones. These images are used to check for abcesses, or infections at the end of the root of the tooth and root fractures. Full Mouth Series: This is a series that combines Bite Wing X-ryas and Per-apicals. Commonly this will be recommended when you come in as a new patient to ensure the complete health of the teeth, bone and gum tissues. Once you are an established patient a full series will be recommended every 3-7 years depending on your individual risk factors. Come Beam CT: This is a newer image we obtain for dental patients. The x-ray is taken by having you sit in a seat and the machine rotates around your head. The image allows us to see all of the anatomy of the teeth and jaws in fine detail, and create a three dimensional reconstruction. This is x-ray is recommended prior to having dental implants and braces. The first time you are told that one of your teeth needs a dental crown (cap) you may wonder why you can’t simply have a filling done? There is a very big difference between a filling and a crown, and the recommendation is based on the condition of your tooth and which treatment will give it the best chance of long term stability and health. All filling material starts out soft and then gets more firm once placed inside the tooth. Fillings being successful are dependent on good strong outer walls of your tooth to provide support. When the inside of your tooth has been decayed or removed to a point where the outside enamel walls are fragile placing a filling subjects the tooth to unnecessary risk of a new cavity forming or the walls of the tooth fracturing off. A crown is placed around the outside of your tooth, supporting the entire tooth and adding strength and resilience. In addition to a tooth that has been weakened from the inside by a cavity or previous filling, if your tooth is cracked or broken reinforcing it from the outside is the best treatment. Both fillings and crowns have a lifespan and will need to be replaced in the future. Our goal is to recommend the treatment that will last the longest based on the condition of your tooth and has the least risk that that tooth will have future problems. Today when a natural tooth is lost the ideal solution to replace both the function and esthetics is to use dental implants. 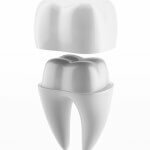 the process of replacing a tooth requires several steps and three distinct replacement pieces, the dental implant, implant abutment and crown. Dental Implants are replacement tooth roots and are placed in the bone below the gum tissue and fuse to your bone. 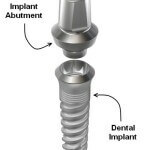 In order to connect a dental crown, dental bridge or a denture to a dental implant once it is healed a connector piece is required, called a dental implant abutment. Dental implant abutments come in many shapes and sizes but all accomplish the same goal. 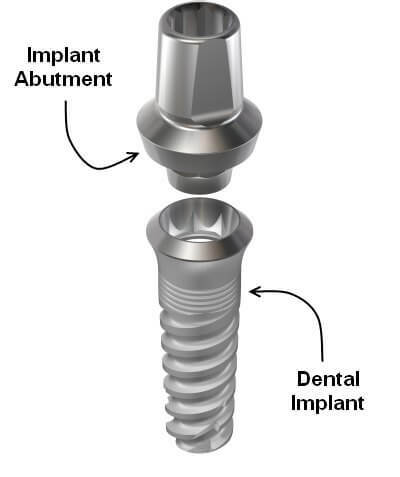 The abutment nests inside a hollow area in the center of the implant and then is retained in place with a screw. The majority of the abutment extends above the gum tissue, then the crown is attached to the abutment. The shape, size and material the abutment is made of will be chosen based on the type of tooth being replaced (front tooth or back tooth), the type of replacement tooth or denture being planned and the material from which the replacement tooth or teeth are being fabricated. If you are having dental implants abutments are a required piece of completing your care.